It's very difficult to review something like the Tablet Claw. For starters, my first instinct is to make the entire thing one big Inspector Gadget joke. Then there's the fact that I have no idea why anyone would need this. 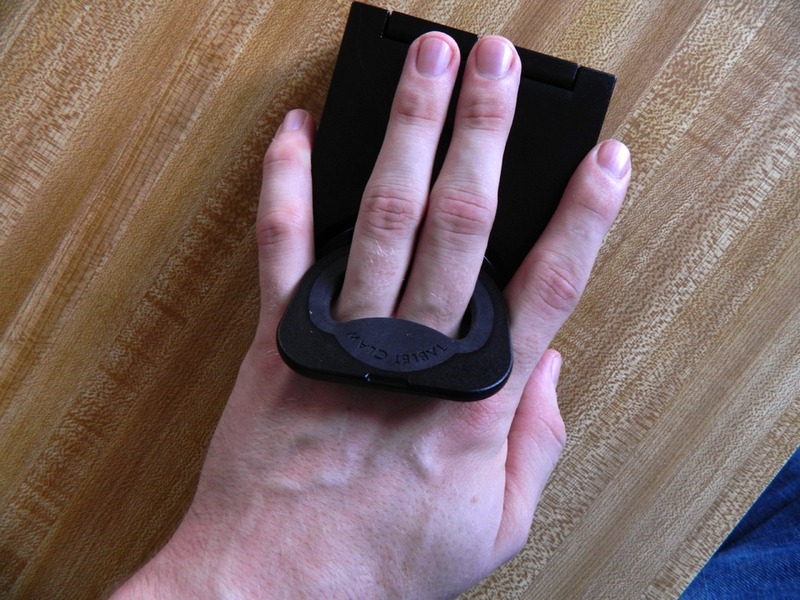 The Tablet Claw is a device that you slide your tablet into, and a little plastic piece that kind of looks like the tab you open soda cans with (called a "ringlet", apparently) folds out and gives you a way to grip your tablet. Okay, hang on, though. I'm an open-minded person. Perhaps there is a use case for this. We will set aside, for the purposes of (most of) this review, my personal belief that a tablet is already pretty portable. We will ignore that this is one of the primary reasons tablets exist. We will forget, temporarily, that spending $39.99 on an accessory to prevent you from dropping your tablet probably says more about your coordination skills than you'd like. How does it hold up as a device? Not well at all, actually. Before we get into how well it works, I want to go over the hardware itself. 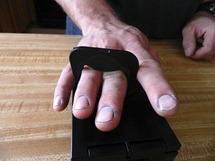 The Tablet Claw's main component, the grip, is a large piece of black plastic with a wide "hook" on each end. Because this whole thing is one piece, it doesn't expand or contract to fit any device at all. For an accessory that touts itself as "universal," it's a pretty risky approach. In general, if you're going to go with "one size fits all," you should probably check to ensure that's true. Actual instructions for a tablet accessory: use pliers. There is one small saving grace, however. Well, kind of. The inside of each hook has a rubber insert. The package comes with a secondary set of inserts that are just a bit thinner. So, technically, it can support two very slightly different sizes. However, removing the rubber inserts is a pain. According to the Tablet Claw's official instructions, the proper way to remove them is to pull them out with pliers. I'm going to go out on a limb here and say that if you have to use pliers on your gadget accessory, it is probably not the most well-designed thing in the world. If this were the Tablet Claw's biggest sin, though, it might not be a big deal. Unfortunately, this is just the start of the problems. "The Tablet Claw is the only universal stand and grip for all 10.1" and 7" screen tablets" according to this video. 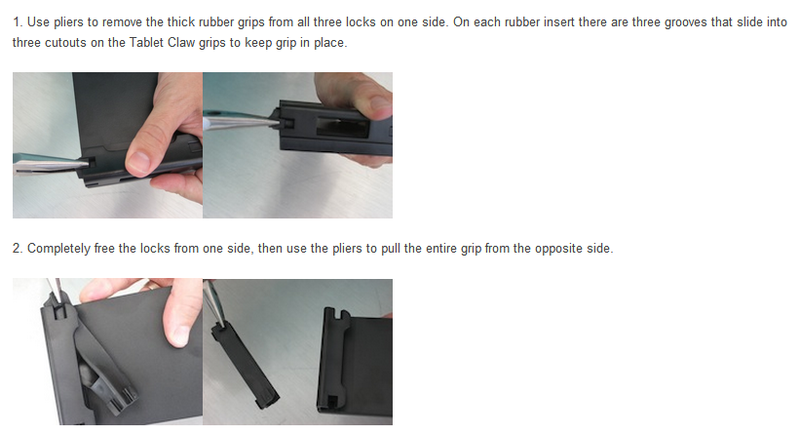 "Universal Grip Design fits the iPad 2 & 3, ASUS, Samsung and Kindle Fire" according to the site's home page. Just which ASUS and Samsung tablets it's supposed to support are anyone's guess. "The Tablet Claw securely fits the iPad 2 & 3, The ASUS EE Transformer, Samsung Galaxy and the 7 in. Kindle Fire" according to the FAQ. Okay, this is not looking good, you guys. I'm pretty sure the "EE Transformer" doesn't exist. This makes it incredibly difficult to be sure just which tablets this thing is supposed to support. I initially tried it on my Xoom. This is a 10.1" display. That qualifies under the first definition of "universal," and I'm not going to beat around the bush here. I was literally screaming with rage in the first few minutes of trying to slide my plus-sized slate into this thing. It did not slide in easily at all. It requires intense pressure to fit. The included (brief) instructions say to "pull outwards on grips slightly away from the tablet". However, the surface area that you're given between the tips of the grip ends and the surface of the tablet is very minimal. Barely enough to fit even my own small fingertips on. Not to mention, the plastic around the grips is extremely inflexible. "Pulling outward slightly" doesn't make the application process any easier. To say nothing of getting the tablet out again. I tried again on my Nexus 7 for the sake of science. 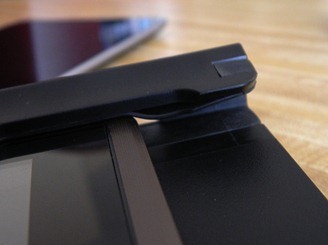 The Tablet Claw does, after all, promise that it works on 7" devices. However, it was equally painful to slide the grip on to this tablet as well. 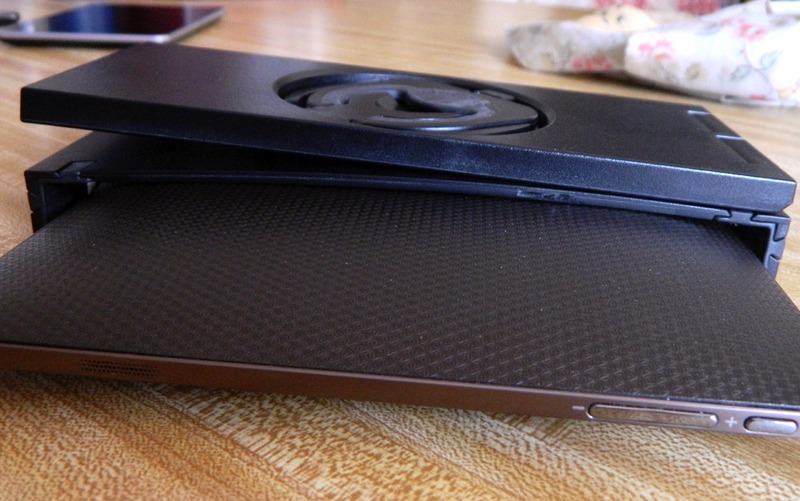 I was concerned that maybe the Xoom was too thick to easily slide in, but the Nexus 7 is considerably thinner. Still, no go. The outer kickstand here is as closed as it can be. It will not properly fold away while attached to the TF101. It actually bent the Tablet Claw. Even if you are bizarrely okay with your accessory being bent so that it can fit on your tablet, this has the unfortunate side effect of making it impossible to close the tabletop kickstand. Even worse is that with the claw in this position, it's difficult to open the ringlet so you can, you know, use this thing for its intended purpose. It's just awful. Also, while sliding the Transformer into the claw, I noticed that the rubber inserts were bending and warping. It was very difficult to slide this thing on in a way that wouldn't result in these things folding all over the place. Left, Center: His fingers barely fit inside the ringlet. Right: Mine fit perfectly, but I also have relatively small fingers. I tried to put off asking this question. I wanted to give the Tablet Claw a fair shot. After attaching this thing to the closest I have to an officially supported device, only to watch it bend into an unusable shape, I'm driven back to the insurmountable problem: why? Tablets are inherently easy to hold. They are designed to be lightweight and portable. Seven inch tablets, which this thing does specifically advertise to support in some places, make even less sense. If your device can fit in a reasonably large pocket or purse, then just how difficult can it be to hold in one hand? In a world where this accessory works as advertised, I'd leave it to the reader to decide if it's worth the asking price. However, I fear physical damage to my tablets could occur if I slide them in and out of this thing too much. When a $40 piece of plastic introduces that kind of worry, one has to consider just being more careful. This demo video doesn't really do much to answer the question of why I need this. "But what about the built-in kickstand?" I hear you cry. "You love kickstands, Eric!" Indeed I do. In fact, it's my personal belief that all tablets should have kickstands. 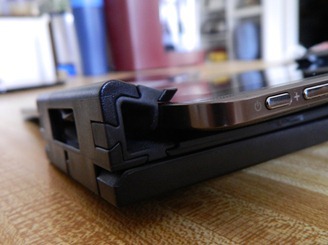 However, failing that, there are cases you can get that have makeshift stands built in, like the rotating stand case we saw leak for the Nexus 7 a while back. These would be so much better for propping up a tablet and have the added benefit of providing extra protection for your investment. 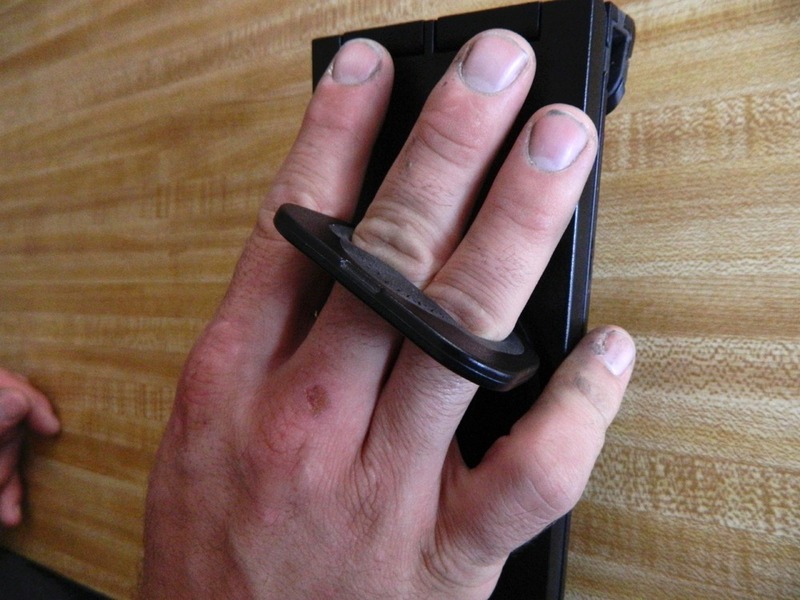 Maybe, maybe the need to use a Tablet Claw while giving a presentation is legitimate. I wouldn't know. It's been a while since I had to give a speech in front of a crowd. However, I can't imagine a high-powered executive giving an intense PowerPoint presentation would look all that confident with a plastic safety grip on his tablet. Unless he also drinks his coffee from a no-spill sippy cup and drives his BMW to work while in a booster seat. I have no idea why this accessory exists. I was honestly excited about trying it out when it arrived. I love playing with new accessories and this one was certainly unique enough to have my attention. Within minutes of opening the Tablet Claw, however, I was seriously questioning whether it was a good idea to continue. It was physically painful to slide it on to tablets that weren't explicitly supported, and the one that was name-checked on the site deformed the claw when I used it. It's possible that this would be a great accessory for an iPad. It seems pretty obvious from the company's marketing that this was designed with Apple's tablet in mind first, and Android tablets second. Maybe this thing fits them better, but we're not the iPolice. We're the Android Police. And we were promised a device that would work on some vaguely specific Android tablets, maybe. It worked on exactly zero of the three we tried, one of which was specifically called out by name on the site as being supported. Reports of the Tablet Claw's universality have been greatly exaggerated. More than anything, though, this grip seems designed to stay on your tablet. 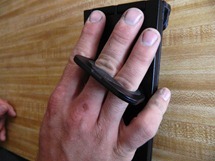 It grips so tightly and is so difficult to attach that one would assume it would never leave your slate's side. This makes protecting your tablet while on the go very difficult. A portfolio case with a built-in stand of some kind would be much better and offer much more protection. As for the "problem" of small, lightweight devices being difficult to hold in your hand, may we suggest some hand coordination exercises? Who would need this: Steve Urkel, Mr. Bean, or any other character known for being too klutzy for their own good. Who would want this: Collectors of esoteric Android accessories. Perhaps a museum would be interested in this someday. Who wouldn't need or want this: Anyone who has finished developing their fine motor skills.